This herbal vinegar face soap recipe features sage for its astringent and anti-inflammatory properties, plus chlorella, a nutritious algae that has impressive acne fighting and anti-aging skin benefits. It’s especially helpful for those with normal to oily, or acne-prone skin. 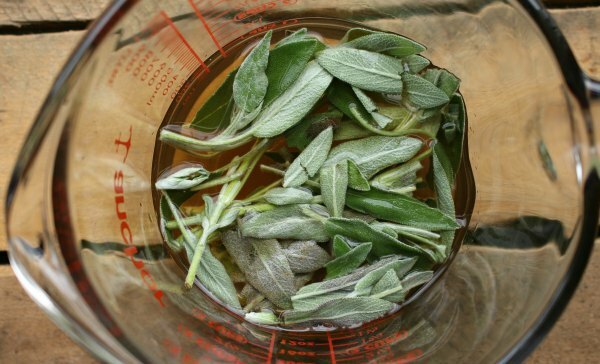 Sage can also be used in oil and water infusions as a subtle natural colorant. In this recipe, I infuse it in vinegar. The soap also stars chlorella, an algae that’s been studied for some pretty impressive skin benefits. It also has the added bonus of turning your soap a pretty color that starts off dark green, but lightens over time. Chlorella is one of the first natural colorants I experimented with when I started making soap and it remains a favorite to this day. I use it to replace spirulina in soap recipes since it doesn’t fade as quickly, especially if you cure and store the soaps in a dark area. You can buy organic chlorella powder (Chlorella vulgaris) from Mountain Rose Herbs. To make this soap, you’ll first need to make a sage infused vinegar: Fill a half-pint or jelly jar about 1/4 to 1/2 of the way with fresh sage, then fill the rest of the way with apple cider vinegar. (If using dried sage, fill 1/8 to 1/4 of the way with dried herb instead.) Infuse for at least one day or up to a week, then strain for use in this recipe. Extra vinegar can be added to bath water, or diluted and used as a hair rinse. Make the lye solution with just the distilled water. Stir the chlorella into the lye solution while it’s still hot. Add the infused vinegar to the lye solution after it has cooled, then blend the lye solution/vinegar mixture with the warmed oils. 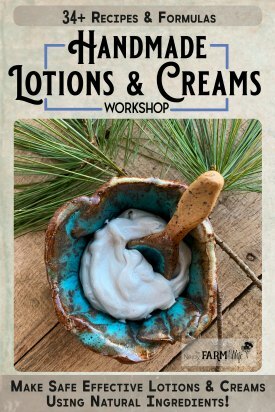 When made as listed above, this recipe may be helpful for normal to oily, and/or acne prone skin. Sunflower oil can be replaced with sweet almond, rice bran or safflower oil, while grapeseed oil can be replaced with hemp or avocado oil. Substituting oils will give slightly different properties to the finished soap though. Allow the soap to cure a minimum of 4 weeks before using. Because of the higher amount of “soft” oils in this recipe, it will harden and improve even more as it ages. 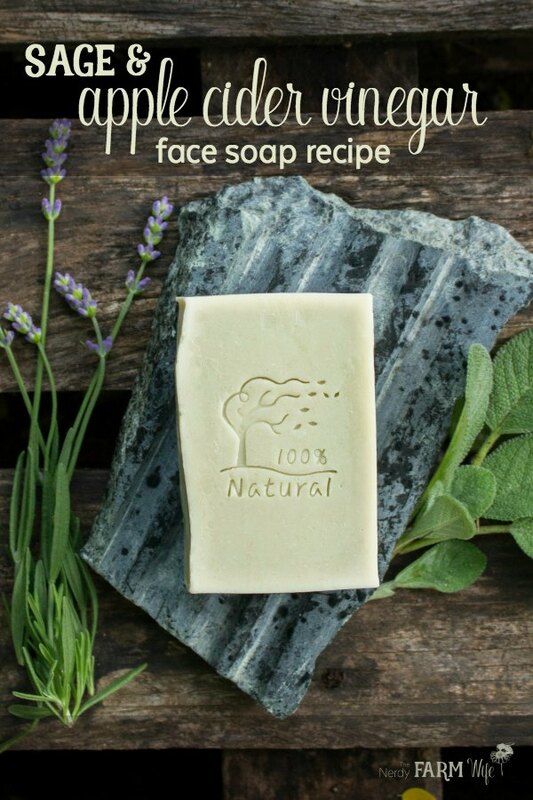 This herbal vinegar face soap recipe will perfectly fill this Crafter’s Choice Regular Loaf Mold 1501 (available at Amazon). You can expect 7 to 8 bars of soap if using this mold. I bought the soap stamp shown in the photo from Bramble Berry but it’s since been discontinued. UPDATE: Thanks to Sally T. we have a new source for the stamp! You can find it listed as “ZF017B Elegant Acrylic Soap Stamp” in the Kudosoap Etsy shop. You can also find a similar “Swaying Tree” soap stamp in the SoapRepublic Etsy shop. I have that stamp too and love it equally as well! If you enjoyed this recipe for Sage & Apple Cider Vinegar Face Soap, let’s keep in touch! Tagged ACV, apple cider vinegar, face soap, sage. Bookmark the permalink. I’m interested in your soaps..I was using a wonderful cleansing bar from a company called Gerda Spillman..this bar was so pure it had Swiss glacier water used in the making, no fragrances etc. they discontinued the bar and I’m looking for a replacement.I have a friend that has skin problems, redness and stinging when she cleanses..which bars do you recommend for it mildness and purity, no exfoliants, but anti-inflammatory, etc. Hi Gerio, That sounds like such a wonderful soap! It’s always disappointing when a company discontinues a great product. Was it called Gerda Spillman Swiss Organic Apple Soap? I see that name pop up when I search, but I can’t find an ingredient list so I’m not sure what else was in it. If you happen to recall any of the ingredients, that might help us with a duplication attempt. 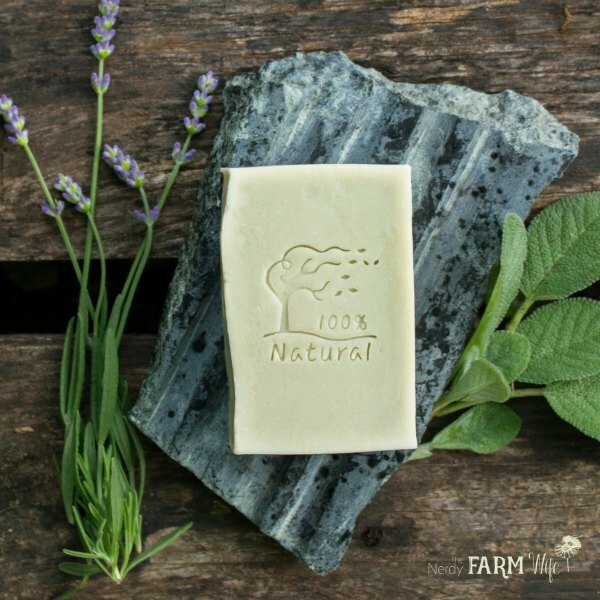 For a mild soap with anti-inflammatory properties, I’d go for recipes that are higher in olive oil and lower in coconut oil, such as bastille type soaps. (Bastille type soaps have at least 70-80(ish)% olive oil in them.) You may even want to replace the coconut oil with babassu oil since it’s sometimes more tolerated by those with extra sensitive skin. You could also try infusing the olive oil portion with a soothing herb such as violet leaf, roses, calendula or plantain. 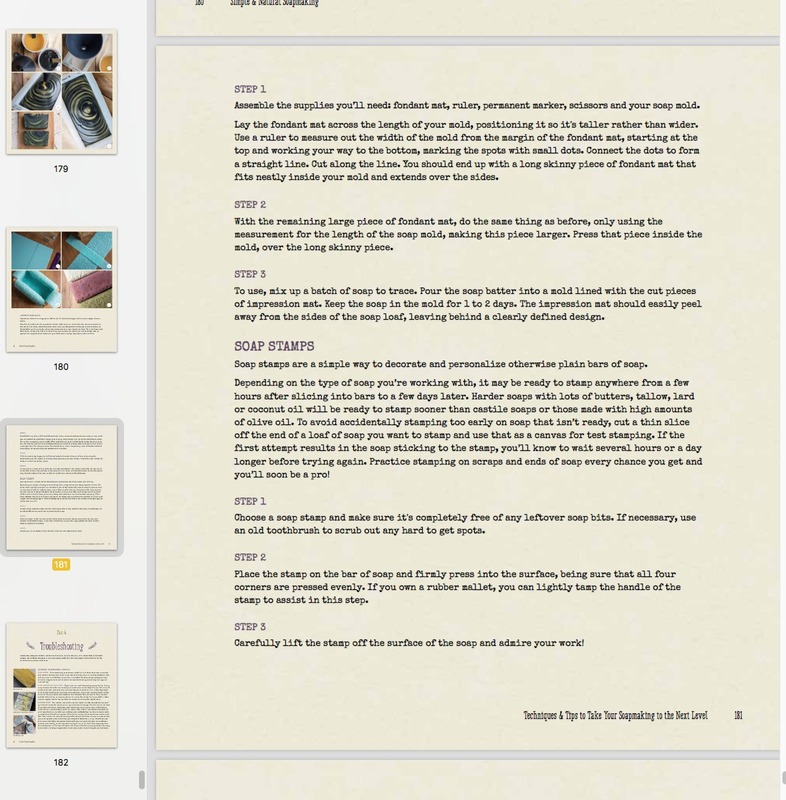 I bought your ebook – thank you for all the great info. I couldn’t find or maybe I missed information about stamping the soap bars. I had a stamp made, but I am having trouble getting it to work well. We are making basic salt soap and we’ve tried stamping at different times – 24 hours, 48, etc… We’ve tried spraying the stamp with alcohol. Any other suggestions or do you have a pdf about this? Hi Lisa, Thanks so much for buying the book! Salt bars get hard *really* fast, so I’ve actually never tried stamping them. I think they might be too hard to get a good imprint, but perhaps someone will see this comment and pitch in their experience and/or tips! I make a lot of Salt soap – I CPOP for 4 hours, then unmold. Many times the bars are still very soft when unmolding – that’s when I would try using a stamp…Check the bars every 20-30 minutes until it’s the firmness that works best for stamping. Also, I have seen many people put down a piece of cellophane over the bar before stamping – that looks like it helps prevent soap from clinging to the stamp. I prefer melt & pour recipes, do you have anything like that? 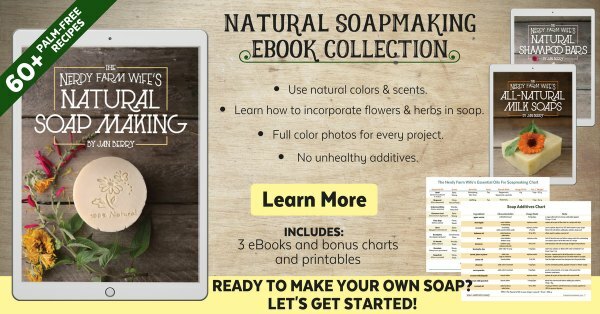 Do you have a page where people can buy bars of your soap? I want to get into CP soaping eventually. I’m just not able to do it currently. 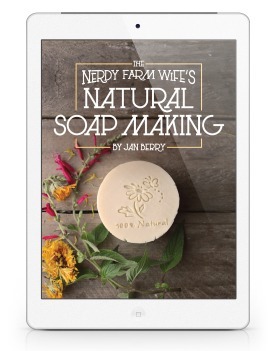 Hello, I’m interested in purchasing your facial soap book and wondering when it will be available?